Pneumonia refers to inflammation of the lungs caused by infection of virus or bacteria. 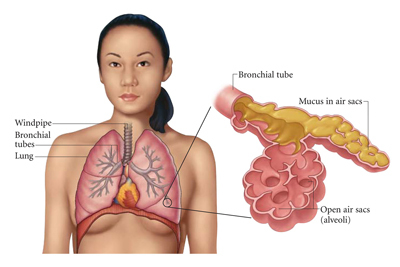 Pneumonia causes difficulty in breathing thus reducing the supply of oxygen to the tissues and organs. If untreated in time, pneumonia will lead to long-term damage to the lung and even be fatal. Medication and surgery can help you recovery completely, however there are many home remedies that may help you ease the symptoms. Pleurisy root. When dealing with pneumonia, pleurisy root is highly recommended since it will reduce inflammation of the pleural membranes in the lungs and enhances secretion of healthful lung fluids. Also pleurisy root is a favorite natural remedy used in the treatment of many other respiratory illnesses, such as bronchitis, influenza and chronic coughing. Baikal skullcap. Usually, this herb is available in Chinese herb store. Using Baikal skullcap with several other antibiotic herbs such as goldenseal, barberry, and yellow root is proved very effective in reducing pneumonia symptoms. Garlic. Garlic is regarded as an effective antibiotic. Chop the garlic into small squares and add to your meal as often as possible. Compared to common prescription antibiotics that kill both good and bad bacteria blindly, garlic only focus on the bad germs without killing the good bacteria. Ginger. Ginger is effective in treating most of the respiratory diseases. Cut the ginger into small pieces or squares, and boil the ginger and brown sugar with water and drink a cup of ginger tea every day. Holy basil. Add a bit of black pepper from this herb to your tea and take it every 6 hours. This also combats pneumonia. Remove animal proteins. Too much quantities of animal protein add excess load to your digest system which will reduce your body’s ability to fight diseases. Instead, eat more vegetables like artichokes, cauliflower, peas and potatoes to get wholesome quantity of protein. Get plenty of Vitamin C. according to the Mayo Clinic, Vitamin C may play a important role in preventing pneumonia. Drink carrot juice. Carrot juice benefits the lungs significantly by adding anti-oxidants to the body’s damaged tissues. Besides, carrot juice is rich in vitamin A, potassium, calcium iron and vitamin B-complex, which are important to your health. Drink plenty of water. People with pneumonia should drink at least 8-10 ounce glasses of water to maintain the general hydration level.